ALL THE TIME GOD IS GOOD! : What's so Amazing about Grace? Today, I want to answer a question that though isn't asked in a straightforward manner but does seem to be the foundational question at the heart of all the objections to God's Radical Grace. This question may be worded differently by some. However, the question is basically the same no matter who asks. Just what's so amazing about Grace? Now, most religious folk would never ask such a direct question. They use more subtle wording. They make statements like, yes Grace is good, celebrate Grace, but what about holiness? Grace is important, but we must focus on being more obedient. Some even say Grace isn't the goal, we must focus on holiness. This is the mindset of many believers captive to the traditions of men. Grace is the baby steps. The initial entry into Christianity begins with Grace but once a believer, the focus becomes one's performance, accomplishments, and achievements. I and many other well studied leaders and ministers have written and spoken about God's Radical Grace. The Good News Gospel has been spread worldwide. There is truly a Grace Revolution covering the Earth as the waters cover the sea. Yet, in spite of this overflow of Good News, many still cling to their traditions. They will hear the Good News with legalistic ears and respond in kind. Hence, the prevailing mindset that Grace is for beginners. Grace is unimportant after we are saved. Traditional religion calls for the lost, the broken and hurting, those outside of Christ, those separated by their fallen nature to salvation. They call the broken to wholeness. They call the sinner to receive right standing. They proclaim God isn't angry at you, He has arms open wide to receive you freely. Then they respond, and they receive Jesus and His free gift, and at this point, the party's over. Once salvation is received, the rejoicing ceases. The loving gaze of a merciful Father morphs into a grimace, a scowl replaces an affectionate smile. The approving, open arms of the Father become folded in disappointment. The outstretched hand lifting up the hurting closes into a clenched fist of outrage. The finger pointing to the Father as the only help turns into a finger pointing accusatively. What happened to the unconditional love of the Father? What happened to the God who isn't moved by one's sin and offers eternal life? Where is the Father who doesn't ask you to do anything to earn eternal life? Where is the Good News that all one needs to do is believe? 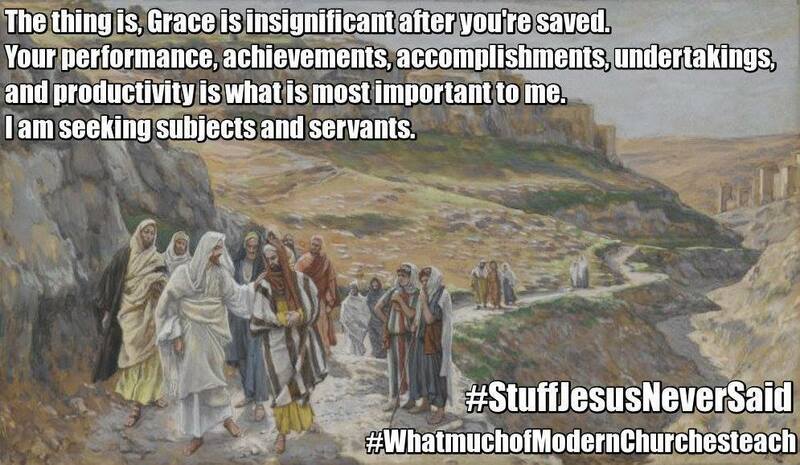 Sadly, once one receives Jesus, Grace seemingly gets tossed to the wayside. Grace is no longer the focus of the Christian life. Efforts, working hard, performance, faithfulness, giving, achievements, and accomplishment become the main criteria. If Grace is ever mentioned, it is done so with an altered definition. Grace becomes simple empowerment. It becomes defined as some form of ability gifting empowering one to do, to perform, all the tasks tradition has formulated. Grace is not empowerment. Grace is God's unearned, undeserved, unmerited favor. Once received freely, His divine influence will produce an empowerment. Grace received will produce an empowerment. That's what Grace does but that's not what Grace is. Yes, Grace produces an empowerment in believers, that is the truth. What we mustn't do though is put a timetable on that empowerment working in the lives of individual believers. We mustn't look at a believer who is struggling in a long-term sin and assume that it is proof they must have lost or forfeited their salvation. Tradition would respond are you suggesting that it's ok to live in sin? Absolutely not, Grace gives us dominion over sin. That said we can't create some timetable where one is living in sin and they have only so much time to find victory or they are out. I've pointed this out to tradition ruled folks and they accuse me of being soft on sin. No, I am just big on Jesus and His Grace. I also ask which sins constitute living in sin? For these same ones neglect many sins in their lists. Fear and worry is a sin. Are we worrying weekly, daily, hourly? Well, are we then "living in sin? "I am always met with silence afterward. Because of the lack of Grace understanding, many believers get lost in their spiritual walk, not fully understanding their identity. They hear Grace to gain entryway, and then they hear better get busy showing God you were worth saving. If you don't measure up you are in jeopardy of being removed from salvation. This is why there is so much talk and emphasis on Grace. This is why many ministries have dedicated to teaching the Grace of God. The truth is for years and years many Christians have been leading lives quietly struggling with the idea that God is often displeased with them, disappointed in them, and doesn’t approve of them. They struggle under the weight of trying to perform better, meet Christian “obligations” and “expectations”. They strive in their walk because they sense God is a harsh taskmaster and not a loving Father. Think of this, if Grace is just a doctrine, just an entryway, just for beginners, why did Peter, by the Spirit tell us to grow in Grace? He didn't say to grow in holiness or righteousness. He said to grow in Grace. Why? Because it's only by Grace will find our true identity. It's only in the Finished Work will we see true growth and fulfillment. The Finished Work reveals to us the work is complete. God is satisfied, He has accepted the work of His Son. What's so amazing about Grace? Under Grace, we now know our sins are forgiven once for all time. We realize that we aren't just declared righteous, but He actually made us righteous. We discover that He has already sanctified us once for all, we are already holy. We just daily mature into who we already are. 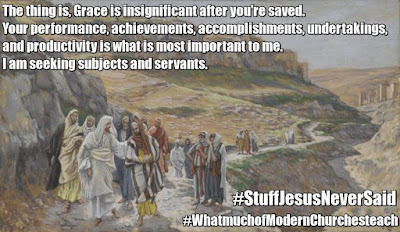 What's so great about Grace? Because of Grace, we see that He has made us accepted in the Beloved. Just as Jesus has perfect acceptance in the sight of God, so do we. Because of Grace, we understand He has approved us and is not mad at us. We see His Grace has purchased our eternal redemption. We rest confidently in our eternally secure salvation. This is the Good News of Grace. Grace isn't about denying that there isn't anyone lost, or separated by sin. That apart from faith all are saved anyway. That Hell is a man-made fantasy and there is no real enemy, satan. Grace isn't even about throwing stones at religious tradition. Grace is about exalting Jesus and His Finished Work and inviting whosoever will to partake of the Good News. In summation, God by His Spirit has been reintroducing Himself and Jesus the person of Grace to His Church, His people, for many years now and they are now seeing their Father in His love and goodness. They are finally finding the peace, the rest, the joy of their salvation, and satisfying life in Christ because of His Grace. No longer having to strive or struggle with receiving His goodness or favor or love in their life. This is the Grace Revolution!